Dovie Monteen Faulkner Forrester, daughter of Benjamin G. 'Bennie' Faulkner and Abby Pearl Briley, married to Ross D. Forrester, buried in Dry Hill Cemetery, Butler, Johnson Co., Tennessee. 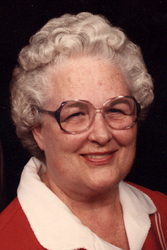 Dovie Monteen Forrester, 86, of Asbury Place in Johnson City, passed away Friday, August 19, 2011 in the Johnson City Medical Center.She was a native of Abilene, TX but had lived in Johnson City for the past 65 years. She was a daughter of the late Bennie and Pearl Briley Faulkner. She was preceded in death by her husband, Ross D. Forrester and by one brother, R. L. Faulkner and one daughter, Pamela Sue Forrester. She was a member of Central Church of Christ for over 50 years. She did volunteer work at the V. A. for 27 years. Mrs. Forrester was a member of the American Legion Auxillary and the VFW Auxillary. She was a member of the Central Community Club and the Central Volunteer Fire Department and the Central Home Demonstration Club. Survivors include; one son, David Kent Forrester of Johnson City; one daughter, Mary Nell Forrester Lilly, Ivan of Johnson City; one sister, Mary Alice Carter of Abilene, TX; two Grandchildren, Ashley Lilly Cutshall, Jeremy, Colorado Springs, CO and Holly Jessica Lilly ,Greg of Johnson City; two special Great Grandchildren, Jasmine Irisa Lilly and Brayden Forrest Cutshall; several nieces and nephews. Funeral services will be conducted at 2:00 pm Tuesday, August 23, 2011 from the Morris-Baker South Chapel. Mr. Tim Hall will officiate. Burial services will follow in the Dry Hill Cemetery in Butler. Family and Friends will serve as pallbearers. The family will receive friends at the funeral home from 12:00 until 2:00 pm on Tuesday. For those who wish, memorial contributions may be made to the Washington County Chapter, American Lung Association, or Washington County Chapter, American Heart Association, 208 Sunset Drive, Johnson City, TN 37604.